Every since I watched Village of the Damned as a kid (directed by Wolf Rilla, 1960, based on the SF book The Midwich Cuckoos by John Wyndham), I realized that kids could be pretty scary. Then I watched The Tomorrow People which was about kids who were the 'next generation', and they were good, if bit nerdy, so I relaxed. At the end of the day, whenever kids turned evil in Scifi movies or books, I could relax and then say, well, it's just Scifi. Then I read Lord of the Flies, by Nobel prize-winner William Golding, and it changed my mind. Not SciFi, it's about kids who get shipwrecked on an island, and it ends up getting pretty ugly. 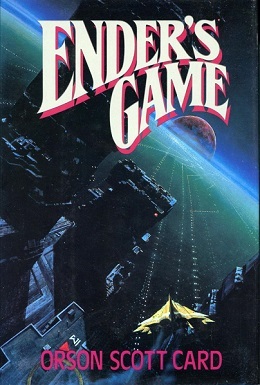 I read the whole Ender's Game series by Orson Scott Card, and thoroughly enjoyed all of them, for different reasons. Ender's Game is about a bunch of kids on an orbital platform being trained for a space battle with an alien race. Although Ender is the main character, I actually found the Bean character more interesting and like a kid, albeit well beyond his years. Card obviously understands kids and how they think and interact, and how they can be cruel to each other, including killing each other. In 2013 it will be released as a film, with Harrison Ford starring as one of the adults in charge of them. Somewhere between Ender and Lord of the Flies, is Greg Bear's novel Anvil of Stars, part of the Forge of God series. Anvil concerns a group of children sent on a mission to destroy an alien race. As usual with Bear, his grasp of the science underlying SciFi is impeccable, but his insight into kids under pressure, and how their neuroses can fester and manifest, makes this novel a great study, taking Lord of the Flies into space. Although a bit long (I nearly gave up on it in the middle part), it has a superb climax and 'bullet-proof ending', rare in SciFi. What makes kids an interesting Scifi topic is the idea that we so-called adults can't control them, that they can outsmart us. Also is the idea that they haven't yet been 'socialized' or 'civilized', and so don't have the same limits we do. Typically in Science Fiction there are a group of kids, or one kid, and the question is whether society will tolerate them or not. I wanted to turn that idea around. So, in my current novel (Eden's Revenge) all human children have been genetically 'upgraded' by an alien race, and surpass their parents by the age of twelve. This creates a mountain of social problems. At a time when the entire race is under imminent threat, the kids get the upper hand. The Eden Paradox is available on Amazon as ebook and paperback and also on Barnes & Noble, Omnilit, AmpichellisEbooks, and Waterstones. Eden's Trial is available on ebook on Amazon and in paperback later this year. Eden's Revenge will be available first as an ebook by Xmas 2012.